Are you trying to be good and make sense of the world -- hoping to make it a better place -- but stuck seeing everyone else arguing past each other and making enemies out of people who should be friends? Are you tired of the splintering and division that weakens our society? Are you shocked by how little goodwill seems to be left in the world? Are you afraid of befriending or voicing support for someone with alternate viewpoints, for fear of being ostracized yourself? Do you feel politically homeless because your opinions don’t fit neatly into any one political box? People communicated with each other in an effort to find common ground working toward a common Good instead of a common ideology? Society progressed from a process of open and reasoned dialectic in which no one silences or censors another but instead in which our ideas are freely debated in an open marketplace of thought and belief where the best ideas can win? Truth can be recognized as an unattainable ideal but still understood as something that can be approached and approximated through the application of reason, evidence, and dialectic? And what if it all got better over time, by design? That's our mission here at IDW.community. We're a non-political social community based on open inquiry, the free exchange of ideas, intellectual curiosity, honesty, and responsibility. We ultimately seek to make the world a better place by creating a community where the values of freedom and productive, civil dialogue are required and enforced. The IDW, originally coined the "Intellectual Dark Web", is a network of thinkers who are willing to think outside of any particular political box. It is a group of people from diverse political backgrounds and suppositions who are committed to hearing one another out honestly, understanding different viewpoints, and engaging concepts through open-ended dialogue that hopes to let good ideas come to the surface and be improved while worse ideas are fairly criticized and left behind. Thinkers in the IDW share a philosophy that no topic is too dangerous to discuss openly and freely, and they believe that the solution to our problems cannot come through crippling the marketplace of ideas with punditry or demands to blindly adhere to some orthodox ideology. The Intellectual Dark Web is about heterodoxy of thought that can be put to productive ends through the time-honored art of dialectic, which means open and goal-directed conversation. If you believe that conservative values are necessary to make society function better or to solve specific problems, the IDW approach invites you to put your best case forward, being willing to admit you might be wrong. The same goes if you’re a progressive or a libertarian. In that sense, the IDW is a resurrection of the Enlightenment. The IDW is liberalism, as that concept is meant philosophically. Although there are many particular points of interest among the varied thinkers in the IDW, what they all share in common is a commitment to having the freedom to ask questions and seek answers to those questions, however difficult or dangerous those may be. That is, under the IDW approach, while you might have very strong political commitments and hold your ideas quite firmly, you’re also open to discuss them civilly and without heated argument, name-calling, mudslinging, or calls for censorship. IDW.community is therefore a place to speak and to hear, to articulate and to listen, to think and to reconsider. There is only primary rule in the IDW approach: be willing to truly discuss any idea, even “dangerous” ones. To do that, you should try to speak honestly about the truth as well as you can, be open to hearing from perspectives different than your own, try to understand those differing perspectives as well as you can, and be willing to change your mind honestly when reason or evidence warrant it. Ideally, you’ll see this approach as collaborative rather than combative, and you’ll engage in conversations not to win but rather to help one another seek truth more effectively by understanding a bigger part of the picture than any one perspective can find on its own. Realize that someone with a different worldview is not “evil” or less human, but rather, most likely, a good person trying to reduce suffering and increase well being as they see it through their personal perception filters and underlying assumptions about society. Have humility and be aware that we all suffer from cognitive dissonance and faulty confidence levels. Give naysayers and most wrongdoers a path of transformation/redemption so we can keep a cohesive diverse society which challenges cognitive dissonance and informs our confidence levels. Use civil discourse as a weapon against disagreeable viewpoints, as opposed to a courtesy offered to extremists espousing them. Avoid censorship of ideas. Be willing to hear one another out, especially when we disagree. Remember that dehumanization is both natural and bad for us, and the quest to humanize other people is a never-ending fight between our instinctual tribalism and the Common Good. The IDW is effectively a mission that hopes to improve society through productive conversations, and IDW.community is here to get you involved. Social networking sites like Facebook and Twitter thrive on conflict and feed it to us. They are literally optimized around engagement, whether that engagement is positive or negative. They see our likes and dislikes and manipulate us via our feeds so we keep coming back to fight those “other” people some more, selling ad space at the expense of civility itself. Whether intentionally or not, these platforms succeed when everyone argues with everyone else, to the greatest degree possible. We aren’t like that here. We seek civil and constructive conversation, mutual understanding even under disagreement, productive conflict resolution, humanization for every member of every conflict, and personal growth for every person in the community we are building. Of course, we don’t avoid conflict. We invite it and aim to create a space where differences of opinion can be discussed in productive, open-minded ways. Therefore, we don’t expect anyone to pass a purity test - in fact, we prepare for everyone to fail at one time or another, address the conflict civilly, and remain a welcomed vibrant piece of our positive community. The IDW is about conversing through issues, especially ones that are contentious, taboo, or difficult to have without the fear of being shut down by political extremists on one side of the debate or another (yes another, not the other). It's founded around the premise that “he who knows only his side of the case knows little of that,” as was articulated by John Stuart Mill in his deeply important book On Liberty. That is, the IDW is founded to serve the idea that we need to hear one another out on taboo topics, learn what our opponents are thinking, and be able to fill in their errors with informed opinions and knowledge. The premise of the IDW is that censorship around contentious topics creates a vacuum into which only extremists will present answers, and we have every reason to believe extremists answers to hard questions are likely to be wrong answers to those questions. When reasonable, fair-minded people aren’t allowed to discuss a certain topic, can’t ask uncomfortable questions, or are prevented from offering certain answers to those questions because any incorrect speech might be put to “dangerous” ends, their censors create precisely the conditions in which extremism takes root and begins to flourish. Think about it. If reasonable people aren’t allowed to offer reasonable observations on some contentious phenomenon because those reasonable observations disagree with the orthodox view, who will make them instead? Extremists who don’t care if they’re engaging in “wrongspeak.” Only those people who have extreme enough views not to care about the repercussions of speaking “incorrectly” on contentious topics will fill the void. This can become a problem anytime the orthodox view might be wrong, which is nearly always. It almost always becomes a serious problem when there are good reasons to believe the orthodox view is wrong, like when the orthodox view seems to fly so obviously in the face of common sense or better evidence as to leave people in doubt. When people think the orthodox view is wrong or lying to them, or they think the truth is being suppressed, they’re likely to latch on to anything that contradicts it. If only extremists with mostly bad responses are able to fill that intellectual and conversational space because more reasonable and cautious people have been silenced, you have a recipe for a fringe extremist view to look like a refreshing dose of truth spoken in the face of power. The remedy to extremism is conversation. When reasonable, sensible people who are willing to adjust their beliefs according to better evidence or reasoned argument are able to fill the spaces around what seem to be wrong answers, nuance is possible. Debate is possible. Conversation and compromise become possible, and they are immediately recognizable to most people as preferable and more likely to be correct than extremism. Extremism will always exist, but when there are no censorship-based conversational vacuums into which it can rush, it stands little chance of gaining traction. Most people are smarter and more reasonable than extremists. Censorship is more of a threat today than ever before in history due to the advent of the Internet and the emergence of the virtual society. The concept of the “online community” has forever changed the way we interact and communicate and we as a society have to change with it. In particular, the “online community” can be a space in which totalitarian ideologies can enforce censorship and trigger self-censorship in ways never before imaginable, and at the same time, it provides immediate access to extremists to fill the conversational vacuums left by would-be do-gooding censors. In these spaces, “friendship” can become cheap and easy. Disagree with your online “friends”? Unfriend. Block. Mute. The end. Now just tweet again and find ten new ones who already agree with you. As a result, virtual purity tests have become the norm, and if friends fail those tests, even to a small degree, they are often dehumanized, lumped in with other dehumanized people who may share similar or related views on this one subject (“they’re a nazi/bigot/idiot/POS”), and discarded. The common practice has become not about understanding or finding common ground, but rather unfriending people who disagree, and often all of their friends, because again, dehumanized friends are disposable. The inevitable result is an almost infinite splintering of society and the near elimination of civil discourse, which has yielded a departure from any kind of morality that benefits today’s society in favour of mob justice and keyboard isolationism. As a result of these changes, we now dehumanize by default -- there often has to be a reason why we don’t dehumanize someone! 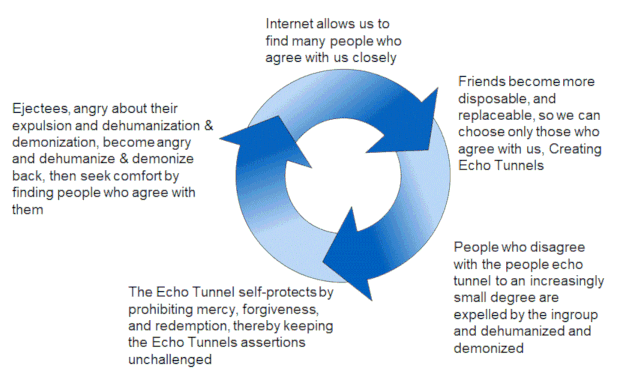 The ease of creating our own, personal echo chambers allows us to shelter ourselves from the challenge which removes a corrective mechanism against extremism. The current trend of deplatforming controversial speakers is a good example of how this online social phenomenon affects real-life society. This whole dynamic feeds back into the problem of censorship and extremism. Our views aren’t tempered through considered disagreement because all disagreement can simply be blocked out of our lives. Meanwhile, we lead ourselves down the very path John Stuart Mill warned against: we find better and better excuses to simply assume we’re right, to know only our side of the case -- if we even know that. Because we then hold strong opinions that we cannot or will not adequately defend, those who disagree with us (often for good reasons!) have little reason to believe our positions considered or valuable. They can easily be swayed by extremists who aren’t the least bit afraid to fill the intellectual space we cannot. This rampant dehumanization has deteriorated our social discourse and we have ceased listening to each other. Impeding or eliminating any possibility for transformation, forgiveness or redemption. We’ve stopped seeking answers and instead blame groups of people, political parties, or organizations for our problems. Dehumanization begets dehumanization. In fact, though it is quite obvious, the world has never seen this level of dehumanization before, and it’s becoming dangerous on every level. Whether from the individual, close circles of friends, or international perspective, dehumanization reduces information exchange and allows bad ideas to take root and fester. We as a society need to be able to talk calmly, clearly, and rationally about long-term impact of modern life on future generations, and that which interferes with our ability to do so will continue to affect us all. We need to be able to discuss contentious topics openly and honestly without shouting them off the table. We need to change course to retain and rescue our humanity. How Does Our Community Help? Today, we see a resurgence of interest in having difficult conversations about contentious topics and maintaining that dialogue in good faith. We’re seeing an exciting growth of long-form communication, both in print and through podcasts and videos. We’re hearing people speak honestly about topics we have all “known” for a long time that we cannot speak honestly about. In the process, we’re redrawing the political map, forming new alliances, coming to more understanding, and making new friends. Member’s build up a reputation score based on their capacity to engage in and maintain productive, civil dialogue[link] and through their activity on the site. Our members enforce a ban on “troll behavior,” flagrant incivility, censoriousness, bullying, and dehumanization by flagging offending content, which can result in warnings and deletions. We encourage forgiveness and redemption for those who have done or been wrong but seek to do better. We promote dialectical exchange, in which all participants are committed to the value of having a productive disagreement in an open-ended fashion, as a means of trying to gain more or better understanding. This platform provides forums for civil discussions on any topic, often based on the Socratic Method to further truth, reason, and inclusion via common goals. Members are encouraged to take a pledge to go forth and be civil and to be willing to hear out those who disagree with us.